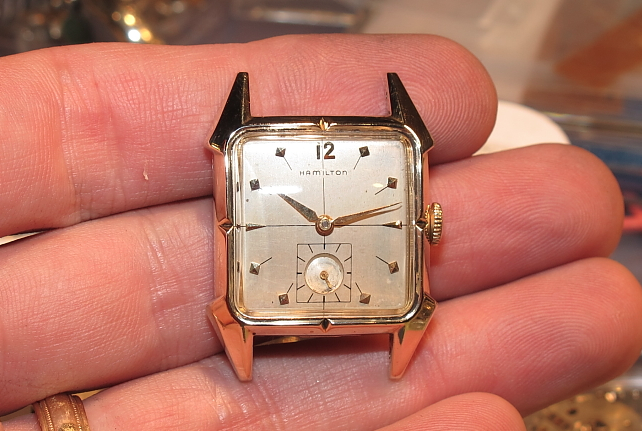 The mid-1950's was an interesting time for Hamilton watches. 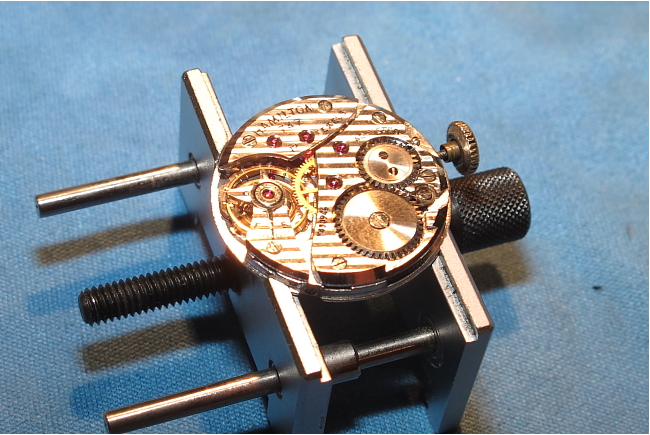 Several new movement grades were introduced... the 12/0 sized 752, 753, 754 and 770's, the 8/0 sized 730 and 735 replacements for the older 747 and 748, the 11-1/2 ligne Swiss movements, and of course the variety of Swiss automatics. And in the late 1950's the electric movement (500, 505) was introduced as well. The numbers of models in Hamilton's lineup seemed to triple over the 10 year span from 1950 to 1960 and increased even more during Hamilton's last US-made decade. 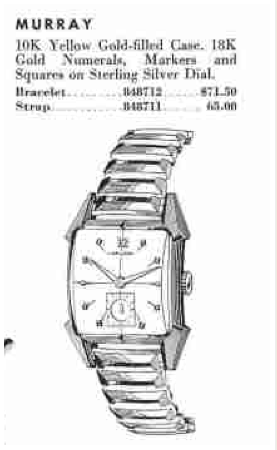 In 1955 Hamilton had two types of men's watches... round and funky-shaped. The latter often exhibited lots of angles, shaped lugs, and dials with angular patterns. 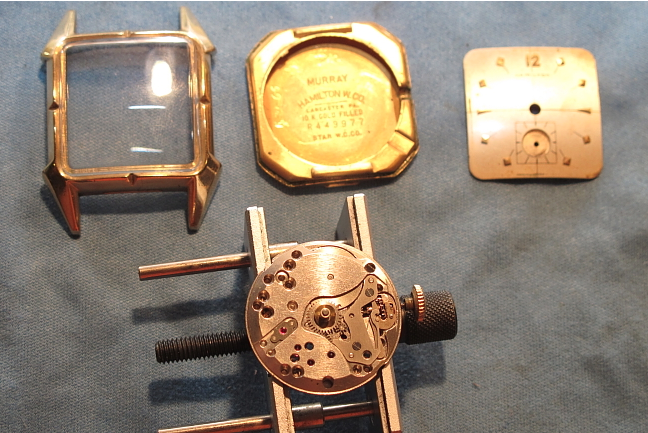 Some of these watches were really out there style-wise but a good example of a 1950's design is the 1955 Murray. The Murray was a mid-grade watch with a 10K gold filled case with 18K solid gold numerals and markers on a sterling silver dial. 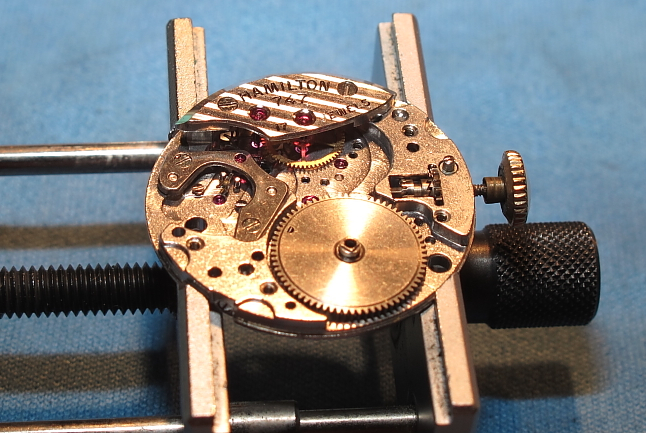 It featured the 8/0 17 jewel 747 movement. The Murray was made for three years and discontinued after 1957. 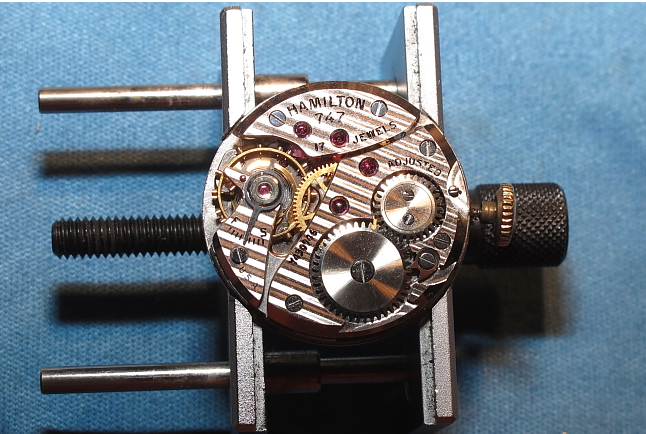 Here's an example of a Hamilton Murray and a recent overhaul. This is what it looked like as received... it's in nice shape, the crystal is scratch free, a little dusty on the dial but otherwise nice. Outside of the case, the grime on the dial is more apparent. Note how the angled markers line up with the lines radiating from the center of the watch. Everything lines up right - which is a good indicator that this is an original dial. 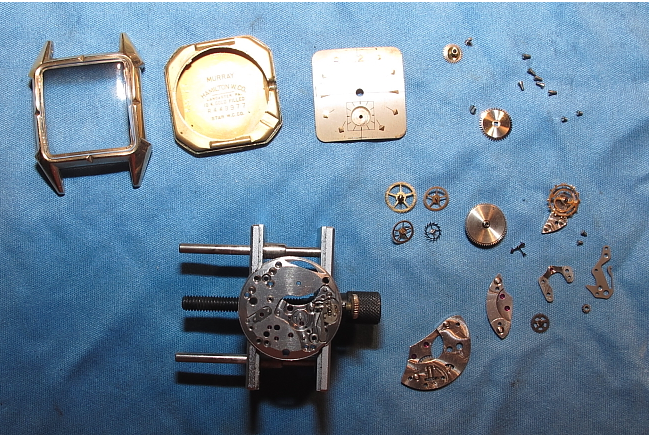 Here the front, back, dial and movement are ready for their various treatments. 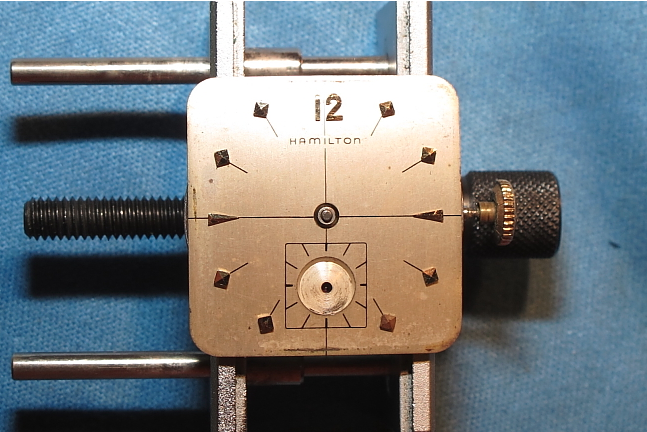 Hamilton often stamped the model name inside the case back, but not always. I really like the 747 movement. 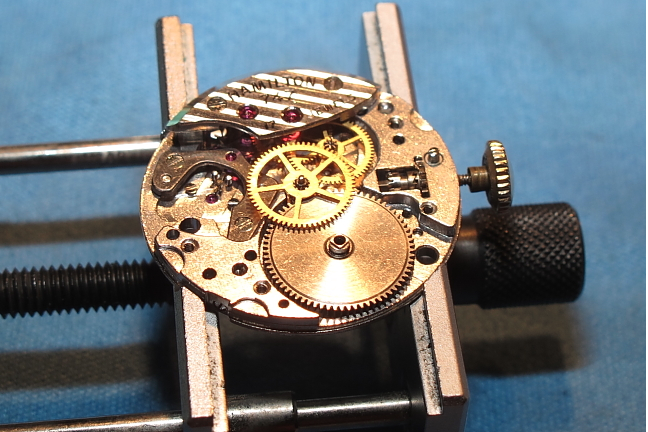 I think it's one of the best movements to tinker with if you want to know how to take apart a watch and successfully put back together. All of the bridges cover no more than two wheels so getting everything lined up is pretty easy (after a little practice). It's 8/0 sized cousin, the 748, has a four-wheel bridge and getting all four pivots to line up perfectly will test anyone's patience (and blood pressure). To disassemble the movement first the canon pinion is removed from the front, then the mainspring tension is let off, then each screw is removed to pull off each part and reveal the wheels underneath. Here everything is laid out in a somewhat organized fashion and ready for cleaning. I clean the heavy stuff separately from the light stuff. I have three jars of cleaning solution. One gets the most dirty, then I move the parts to the second one, and then I rinse them in the third one. When the first one gets really dirty I empty it and put fresh solution in. Then the second jar becomes the first jar. In this shot you can see the fluid gets kind of hazy even with what would appear to have been a pretty clean movement to start with. 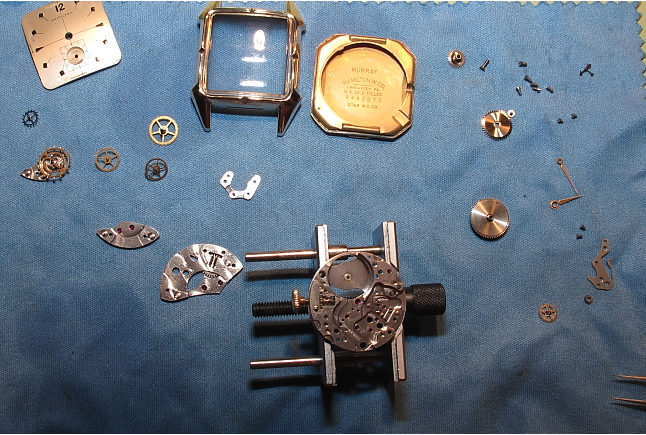 Now all the watch parts are clean. 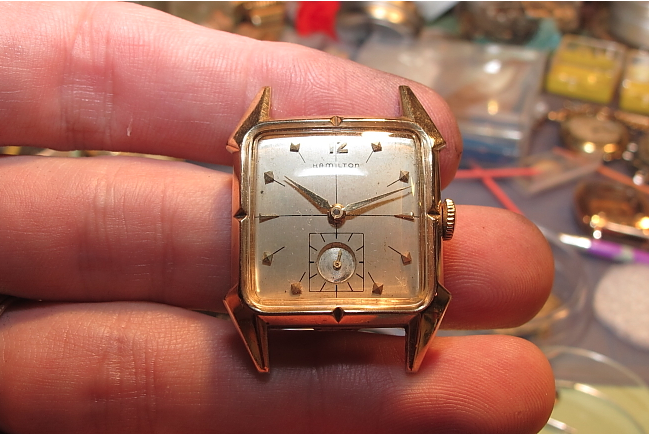 While it all dries I buff the case and clean the dial. 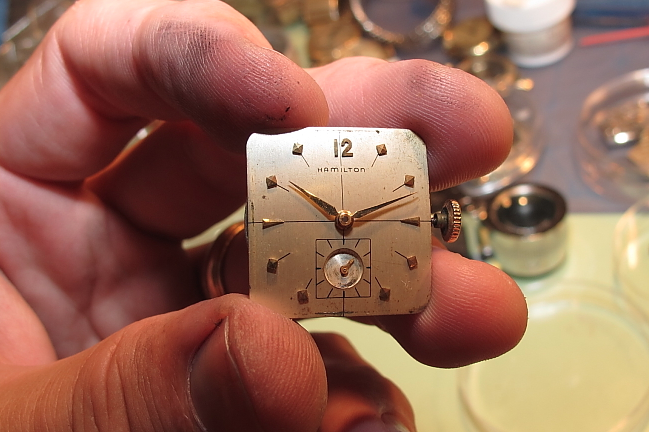 Cleaning a dial is a delicate process and the first rule of dial cleaning is don't do it unless you're willing to get the dial restored - as you're very likely to goof it up. I was quite careful with this dial and was able to get it cleaner but not overdone. Reassembly starts with the pivot fork and the pivot fork bridge. 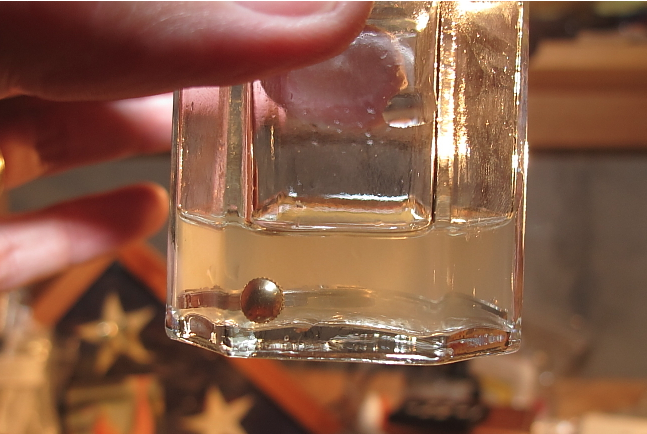 Every jewel and bearing surface gets a tiny droplet of oil. Next the escape wheel and the fourth wheel get installed along with the train bridge. I also put on the mainspring barrel. Next the third wheel and the center wheel go on and we're ready to put the barrel bridge back on. 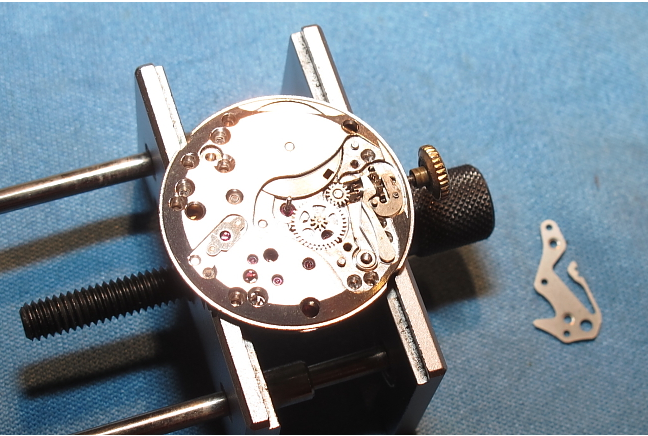 With the barrel bridge back on spring tension can be applied to the mainspring with a few winds of the crown. Then I re-install the balance assembly. I like to have a little tension on the gear train so that the watch will start running when everything is lined up right. 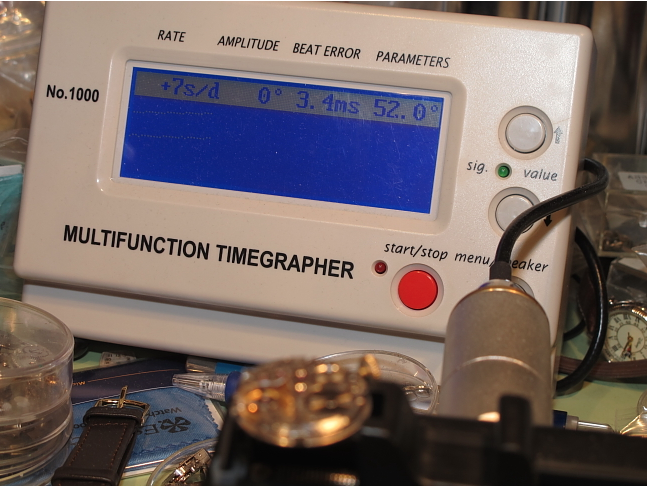 With the watch reassembled and running I put it on the watch timer to see what it looks like... 7 seconds fast per day - pretty good, a slight tweak to the regulator could slow it down but I think 7 seconds is not too shabby. 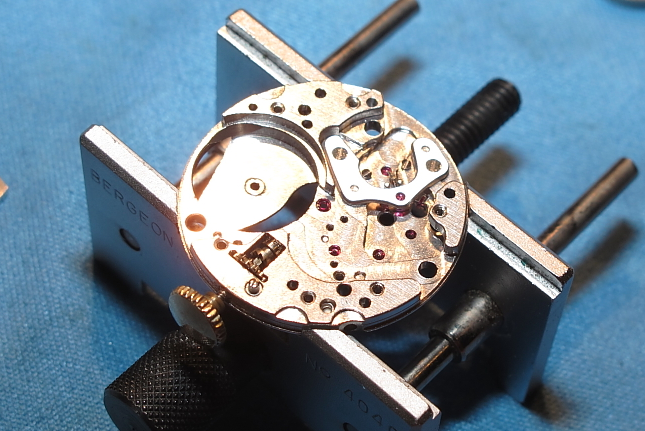 The keyless works on the front of the movement needs lubrication too. So before the dial goes back on all these parts get some grease. Now the cleaned up dial goes back on. And the hands can be reinstalled. Back in it's freshly polished case, this Murray is ready for a nice strap and some wrist time!